See models of early bombers through 1940s through modern day, Norden Bombsight Bomb replicas, a rare collection of 12 bomber jackets, and group/squadron artwork. Rare B-17G bomber – one of 10 still flying in the world – Rides available! Rare B-25J Mitchell – one of 34 still flying in the world – Rides available! 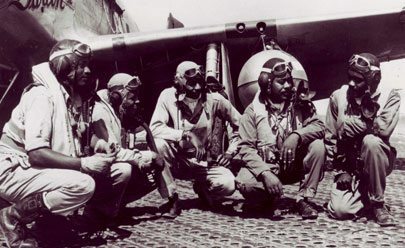 The Tuskegee Airmen set the precedent for African-Americans to excel in military aviation. What began as a shocking idea with many naysayers quickly provided the way for thousands of men and women to serve in combat overseas and in support programs at U.S. bases. The sacrifice, service, and success of the Tuskegee Airmen, many of which were Arizonans, directly contributed to victory in Europe. Thousands left home to serve, many died in combat, and many faced continued prejudice. Yet they flew more than 15,000 sorties, destroyed or damaged more than 400 enemy aircraft, and supported front-line needs from their U.S. bases for the duration. On Saturday, February 9, 2008, the Arizona Wing opened a new exhibit titled “Triumph Over Adversity.” It’s dedicated to the black pioneers of aviation and to the officers and enlisted personnel of the Tuskegee Airmen who served during WWII. This is in recognition of the positive experience, the outstanding record of accomplishment, and the superb behavior of all black airmen, especially those of the 99th Fighter Squadron, the 322nd Fighter Group, and the 477th Bombardment Group (collectively known as the Tuskegee Airmen) who were important factors in the initiation of social change to achieve racial equality in America. The keynote speaker for the event was Dr. Thurston Gaines, an original Tuskegee Airmen and a resident of Glendale, Arizona. Also present as special guests were members of the Archer-Ragsdale Arizona Chapter of the Tuskegee Airmen, Inc. The Women Airforce Service Pilots, or WASPs, were a select few of only 1,074 women who passed the rigorous training of military flying school and became part of the United States Army Air Forces. They flew just about every type of aircraft at the time and logged more than 60 million miles. 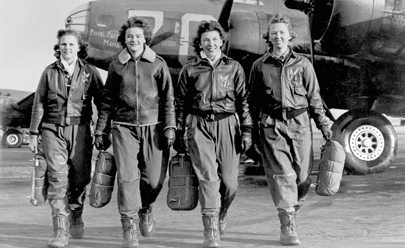 It wasn’t until 1977 when the records of the WASPs were unsealed that the women were recognized as veterans of WWII. The WASPs were formed to ferry aircraft, tow gunnery practice targets, and test aircraft in the U.S. while thousands of men were sent into combat overseas. Dozens of WASPs flew nearly every AAF aircraft type from six bases in Arizona. The patriotic sacrifice, service, and success of the WASPs, many of which were Arizonans, directly contributed to military aviation. Many died in the line of duty and many faced continuing prejudice, yet went they on to ferry more than 50% of the combat aircraft used to win WWII. That was only one of their many feats contributed to victory in Europe and the Pacific and current policies enabling women to serve as aviators in the U.S. military. In the 38 days following the assassination of Archduke Ferdinand of Austria on June 28, 1914, Austria declared war on Serbia and Russia mobilized in support of Serbia which sparked Germany to declare war on Russia to support Austria. This set off a chain of events with 32 nations declaring what was first called the Great War and later called World War One (WWI). The first World War began as a “Gentleman’s War” for aviators. Officers who called bombing missions “hunting,” saw their roles in the war as more civilized than the terror of the trenches. This can be seen by pilots dropping funeral wreaths, messages and inquiries about their own missing in action. Aircraft were also used for bombing in the First World War – something that later defined the Second World War. Initially It was only the airships and dirigibles that had the capability to carry a heavy load of bombs. Two exceptions were the Italians and the Russians, who both had remarkable engineers building some of the finest bombers. While the Armistice was signed in 1918 which ended the actual fighting, the war itself, did not end until June 28, 1919 when the allied powers concluded six months of negotiations at the Paris Peace Conference and signed the Treaty of Versailles. In 1952 the US Army identified a requirement for a medical evacuation and general utility rotary wing aircraft to replace its H-13 Sioux helicopters, the model made famous by the movie and television show series M*A*S*H. Twenty companies submitted designs and Bell Aircraft Corporation was selected 23 Feb 1955 to build three Model 204’s, which the Army designated XH-04. 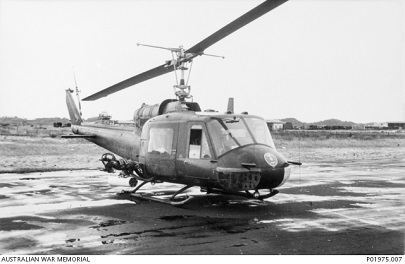 It was the Army’s first contract for a turbine-powered helicopter. he first fight was on 22 Oct 1956, two days after Bell Aircraft founder Lawrence Bell passed away. The XH-40 prototypes were followed by six YH-40’s for further testing. The fuselage was stretched by one foot and the turbine horsepower rating was increased. About this time, the Army designated the H-40 to be the HU-1. Early on, the HU-1 was called “Huey”. There are several stories as to how the HU-1 became know as Huey. One explanation is that the Bell engineers knew the YH-40 as the HU Experimental and simply referred to it as the “HU-E.” Or, that HU-1 could like that “HU-I”.